We love hosting events at Happy Days. Our site is the perfect size for an exclusive hire party. 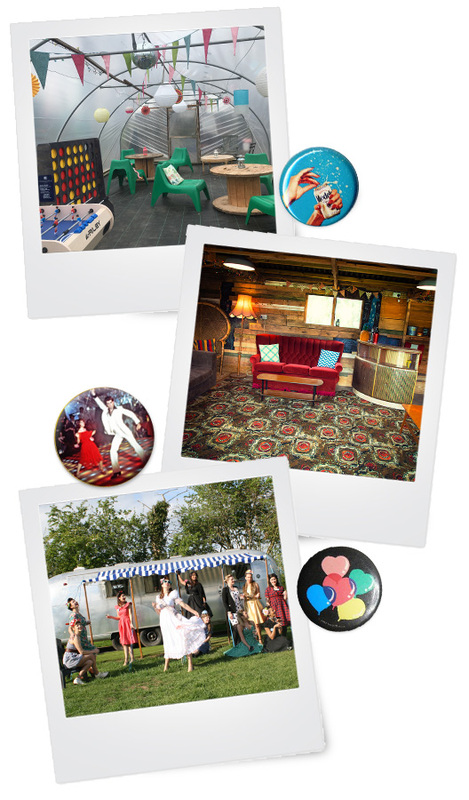 If you are planning a festival style party, our 8 vintage caravans sleep upto 32 people (30 if all are adults). With upto 4 additional camping pitches for any extras, our glamping site has a maximum capacity of 45 people. If you have concerns about the weather, we have indoor spaces that you are welcome to use. Our fabulous Red Shed with comfy sofas and a vintage bar, we only open for party bookings. We also have the large poly tunnel social space with seating and a table football which has been the setting for a disco or two! We have a large central fire pit perfect for a big group. Noise is no problem as we have no neighbours so you are welcome to bring your own music, lights and party! Exclusive hire weekends cost from £2,000 for 2 nights in low season to £2,800 in July and £3,800 for 3 nights in August. We also host small corporate glamping get-aways, one night midweek stays outside of school holidays cost from £895 for exclusive hire. This can be tied in with a visit to Suffolk Escape Room our onsite team building experience. Please get in touch with us if you would like to discuss an upcoming Hen Do, 30th, 40th, 50th, 60th or even 70th Birthday Party. If you don’t have anything in particular to celebrate we are the perfect size for a get together with a group of friends or extended family.